Domestic football has returned to Sierra Leone, after an 18 month absence due mainly to the Ebola crisis in the country, but in controversial circumstances. The league that began playing on Saturday has been formed by eleven out fourteen of the country's top-flight clubs but without the blessing of the Sierra Leone Football Association (SLFA). The SLFA has called the league 'illegal' and warned it would take action against clubs, officials, players and coaches participating in the competition. The opening fixture which saw East End Lions beat FC Kallon 1-0 at the National Stadium in Freetown on Saturday was watched by the sports minister Paul Kamara. "It's now 18 months since we last played competitive football. We should be playing football irrespective of the impasse within the SLFA," Emmanuel Saffa Abdulai, head of the breakaway league, told BBC Sport. "We believe that the SLFA led by Isha Johansen is incapable and unable to organise a league that will have all the fourteen teams playing because that executive has lost legitimacy." But the secretary general of the SLFA Christopher Kamara has dismissed Abdulai's claims: "We are the legitimate body and we will soon start our league which is recognised." Kamara then referred to a press statement from the SLFA which highlighted the role of the association in the running of domestic competitions and the sanctions clubs in the breakaway league may face. "The SLFA would like to inform the 14 premier league clubs and the general public that the organisation of competitions on the territory of Sierra Leone solely lies with the SLFA in pursuant to article 73 paragraph 1 of the SLFA statutes," the press statement reads. "Failure to comply with these obligations by any member, officials coaches and players shall leave the SLFA with no alternative but to invoke the relevant provisions pursuant to article 13 paragraph 2 of the SLFA statutes. "Violating the above-mentioned obligations by any member may lead to sanctions provided for in these statutes. "The SLFA would like to inform all its members and the general public that plans are on going soonest for the commencement of competitions nationwide." However the participating clubs are determined to continue with their league. "For such sanctions to be imposed they have to be taken to congress to vote on," said Abdulai, who is also the chairman of Old Edwardians FC. "The stakeholders who have decided to organise the league are the same stakeholders who are members of congress. "It would mean banning almost all the locally based players who qualify to play for the national teams in the country. How realistic is this?" "We can only play a league organised by the SLFA if the Johansen-led executive take us to congress." The breakaway league is yet to secure sponsorship but Abdulai says the clubs are determined to play. "We don't have any sponsorship as of now. The participating clubs are chipping resources together to fund the league because we are committed to play the game." "We'll still continue to play even if we don't get external sponsors. This is because clubs are determined to conduct their own affairs." 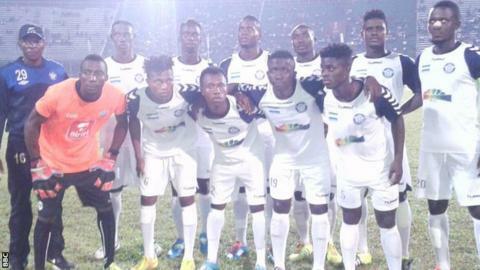 The clubs are also not concerned by the fact that teams from the breakaway league will not be able to represent Sierra Leone in continental club competitions as their league is not recognised by Fifa nor Caf. "We don't really care about playing in African clubs competitions as our priority for now is for our players to be playing regularly and developing their skills," added Abdulai. "However we are going to give the champions of the league a cash prize of over US$3,000 and the runners up will get half of what the winner will receive." Opponents of the SLFA are still arguing with the association, lead by Johansen, over which delegates are allowed to attend the association's congress.